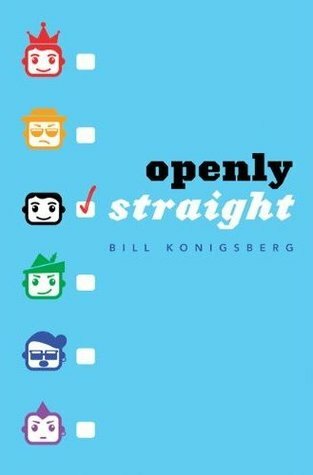 Openly Straight by Bill Konigsberg follows a teenage boy named Rafe who wants to leave his life in Colorado behind him and go to an all boys school on the east coast. Why does he want to do that? Because he is sick and tired of being “that guy kid” and wants to start life anew, in a sense. He is sick of living with labels and wants to see what life would be like to just be seen as “normal”. Now Rafe doesn’t deal with much bullying in his hometown, even his parents are behind him 100%, but he doesn’t like people treating him special. He just wants to see him as he is. It is a very eyeopening book, how our society uses labels like “straight” and “gay”, among others such as “jock” and “nerd”, etc, when it comes down to it, and it really makes you think of how a person feels when they are labeled. Why do we have to live with these labels? Bill Konigsberg writes his characters very well. They are believable, funny, honest, and true. No matter who you are, I feel, you can relate to these characters. Rafe is surrounded by many types of friends and many different types of people you would find in a high school. I love his roommate Albie, he is very quirky and smart. As we get to know Rafe, and the not-quite-a-lie he is living at the all boys school, he begins to fall in love with Ben, a guy who does’t know the truth about Rafe. As the story progresses, life for Rafe gets a lot more complicated. All in all, I loved Konigsberg’s writing and want to read more from him. Although, I felt like the story took a while to really get going drama-wise, and ended way too soon, I really enjoyed it and wished I could read more about Rafe. I give this novel a 4.5/5.